This is the central portion of Michelangelo's fresco on the ceiling of the Sistine Chapel in the Vatican. In 1990, Frank L. Meshberger, M.D., described (in JAMA, volume 264, October 10, pages 1837-1841 - CLICK HERE for an abridged version, contact JAMA for the full article) his recognition that the "purple clouds" surrounding the image of God could be interpreted as a brain. He further argued that this was consistent with Michelangelo's philosophy that the brain gives Man his intellect. In August, 2006 (submitted to JAMA, rejected), Dr. Ashford made additional observations about the Sistine chapel frescoes. 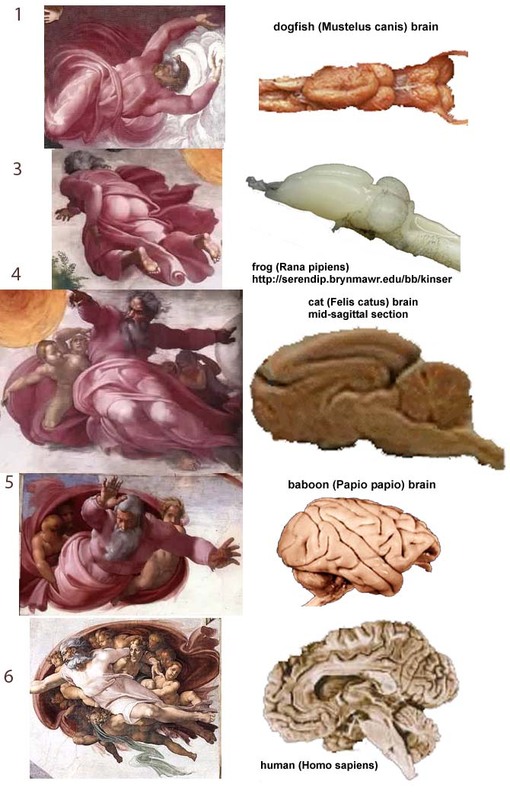 The other 4 images of creation appear to describe brain evolution. At the front end of the chapel, behind the altar, Jesus is sitting in the middle of a coronal image of the brain. See the attached WORD document for that description and pictures. On the first day of Creation, God said, "Let there be light", in the image of a dog-fish brain. On the third day, God said, "Let the earth bring forth grass", in the image of a frog brain. On the fourth day, God made two great lights, in the image of a cat brain. On the fith day, God commanded the waters, land, and air to bring forth animals, in the shape of a monkey brain. On the fifth day, God created man, in the shape of a human brain. There is a long-standing difficulty with scientific facts and reasonable interpretations for those who interpret the Bible literally and contest the basic issues of changes in the World over time and theories about evolution. My daughter Suzanne Ashford addressed this issue very clearly in a submission to the Lexington (Kentucky, USA) Herald-Leader newspaper: SEE THIS LINK. The biggest problem is mistranslation of the Bible and semantic confusion. All things change over time, including religions. The World will become a progressively better place as its people learn how the World works and try to use knowledge the improve life for all. The "bag" seems to be containing God; in other words the brain contains God or God is the creation of the brain. So the title of the scene could be creation of God by the human intellect. That does not necessarily mean Michelangelo was an atheist, for him God existed, but probably only as a necessary creation of the human brain, necessary because of the need of the brain to imagine and believe in the "spiritual". There is a French anthropologist by the name of Teilhard de Chardin that suggested a more or less similar interpretation of the nature of God. But being a Jesuit priest he had to be very careful on how to present it. He said it takes a large number of neurons assembled in a complex way similar to the human brain to be able to understand God. There are those who say that he really meant create rather than understand." "This view of the brain evolution is quite compatible with some new ideas about spirit and God by an Italian teologist called Vito Mancuso. He state that God's spirit works within the natural evolution of the universe and within the laws of physics, chemistry, and biology. According to Vito Mancuso, teology should recognize all modern scientific theories about biology and evolution and should assume that these theories represent the working God's spirit laws." Forms and papers provided on this site may be copyrighted by their authors or the publishers.